School’s out for summer! The end of year celebrations have all wrapped up, yearbooks have been signed, and goodbyes have been exchanged. It’s finally summer time! So… now what? Have your kids already uttered the words “I’M BORED!”? If you haven’t heard it yet, you can bet it will be coming soon. Make it a priority to keep your kids active this summer break. In a study done in 2007 by the American Journal of Public Health, growth in BMI (body mass index) was faster during summer vacation than during the kindergarten and first-grade school years. So, finding ways to make active play a regular part of the summer can make a big difference. Here’s a list of easy, low cost ways to keep your kiddos moving, healthy, and happy this summer! 1. Go on a family bike ride. 2. Have a jump rope competition. 3. Go on a nature walk. Find leaves, rocks, sticks, flowers, even bugs! Make this super easy nature bracelet. 4. Throw on their swimsuits and wash the car (or bikes and scooters). Put on some music to encourage dancing while washing. 5. Create a mini veggie garden, plant indoor pots, or do yard work together. 6. Use sports equipment you may already have lying around (balls, bats, etc.) and create an obstacle course in your yard. 7. Use that same equipment and challenge your kiddos to create their own game. 8. Go for a photo walk or have a silly photo shoot. 9. Take a hike on one of the many great Richmond trails by the river. 10. There’s nothing better than a fresh bucket of chalk! Give them letters, words, or numbers to write, or let them free draw. Teach them to play hopscotch. 11. Make a home video. Have you kids act out or tell a story. You never know; it could go viral! 13. Have a hula hoop contest. 14. 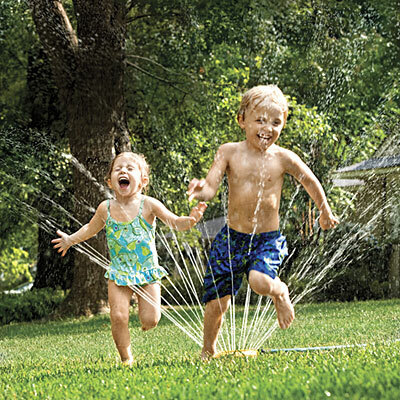 Bust out the hose, hook up the sprinkler, or fill up those water balloons. Play with water! 15. Go park hopping and make a goal to play at a new park each week. 16. Grab some friends and play tag. Check out this list of tag games! 17. Catch fireflies or butterflies. 18. Get your kiddos involved in the kitchen and teach them to cook. Have a cooking competition, like Chopped. 20. Pack a picnic lunch to a park and bring a Frisbee to throw. 21. Volunteer at the SPCA. 23. Walk the dog (or offer to walk a neighbor’s dog) and take different routes each time. 24. Make your own sandbox in your backyard. 27. Try out roller skates, skateboards, or scooters. 28. Make paper airplanes and have a launch contest. 29. Play Hide and Go Seek, Simon Says, or Red Light, Green Light. 30. Walk around a farmer’s market or mall. 31. Go ‘old school’ and have a sack race, egg toss, or a wheelbarrow race. 33. Set up a relay race. 34. Learn how to juggle. 35. Put these ideas and more into a jar or box and let your kiddos pull out an activity each day!